I've been thinking — as you like to garden — what about a composting toilet? Too funny! We have a view from "the church" at the cabin, too. Where else can you sit and ponder life while watching the elk grazing in the meadow?! Thank goodness we don't have all your stairs - I would never make it there in the dark! What a climb! That will keep you in shape. The view is lovely to. Kay - We are planning on putting an addition on the cabin for a bathroom including space for our existing bathtub and a new composting toilet. 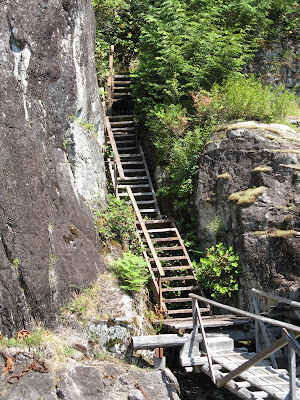 As far as the stairs, we try to "plan" trips to maximize our climb. In the summer that usually includes watering my hillside potato patch. For that quick midnight pee, there is Mr. Pee Bucket on the deck that we carry up the hill at a later time.